I think one of the main differences between me and most of you, dear readers, is that I am older. And, by being older, I can pretty much say that I not only watched more episodes of Julia Child cooking shows, but that I also watched them when they first aired. Today, I made Julia’s bœuf Bourguignon, a hearty dish from the heart of the Burgundy region of France... Heart, of course, being the operative word for Valentine's Day! For many of us, Julia Child is a kitchen hero, kitchen goddess, or even kitchen witch (and I mean a good witch, like Glinda). She is synonymous with food, and only with great food at that. Julia got both my mother and me really excited about food. Mom was always a good cook, but access to Julia on television really changed things in our household. And it changed me, too, as I started watching the shows with Mom at a very young age. My mother became an amazing and adventurous cook, and the entire family's culinary expectations were raised. Today all three of my brothers love to cook too. She inspired - and continues to inspire - me. Akin to Gusteau in Dinsey's Ratatouille, Julia believed that anyone can cook. She knew it in her heart, and she shared it weekly in her signature mezzo-soprano warble. I sometimes look at her recipes in Mastering the Art of French Cooking and am intimidated. But then I remember why she wrote that two volume set, and I simply forge on. I haven't yet had a disaster... well, as long as I followed her directions. when you sauté, heat the skillet first, then add the fat. Whatever you are cooking won't stick. before browning meat, make sure it is really dry, otherwise it won't brown (this goes for chicken, too). be judicious in salting things; you can always add, but it is difficult to take away. while we are on salt, cook your starches (potatoes, pasta and rice) with salt, as this is when they absorb the flavor. if you make a soup and over salt it, add a peeled, raw potato and simmer for a bit - it should absorb the excess salt. She modeled the art of believing. I think it is true that if you believe it, you can do it. Forge ahead, don't stray from your objectives, and your results will be good. Okay, the results aren't always good, but you definitely learned something in the process. She advised me wisely. "If you're afraid of butter, use cream!" I made my first bœuf Bourguignon when I was just out of college and had just purchased both volumes - used - of Mastering the Art of French Cooking. Being pretty young, I was very exciting to make this basic, exotic sounding and, let's face reality, peasant dish for my friends. It cost me a fortune, took endless hours, exhausted me - and was, in the end, a happy success. I didn't make it again till after the movie Julie and Julia came out on DVD. Once the movie was purchased, a food-themed movie night was a given. But let's first talk about the movie. Did you like it? I liked half of it. I liked the parts with Meryl Streep and Stanley Tucci as Mr. and Mrs. Paul Child; I could watch them all day. I was bored, annoyed and felt cheated, however, by Julie. I am still hoping that someone will eventually edit out all the Julie parts to make a one-hour docu-drama of Julia and Paul. Something I discovered after all these years of not making bœuf Bourguignon: doing it right still takes time. You can't just whip it up after a long day at the office. But that's okay; that is why we have weekends. I think I relearned as much this time around as I learned the first time. Naturally, the recipe that follows has my slight changes. I certainly don't use American bacon, for example, and (as you can guess) I leave out the garlic. But other than that, it is pretty faithful to Julia's. So, pour yourself a glass of wine, tune up your best falsetto, and warble with me: Bon Appétit! chose salt pork over bacon as this dish would not do well with a smokey American bacon. Always cut your own stew meat. 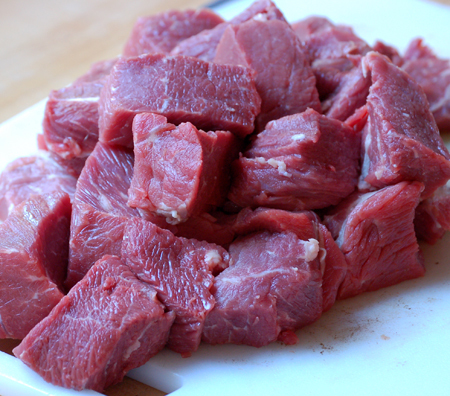 The stuff you can buy as "stew meat" is usually the dregs - full of fat and generally the trims. I used a chuck roast and cut it into 2-inch cubes. 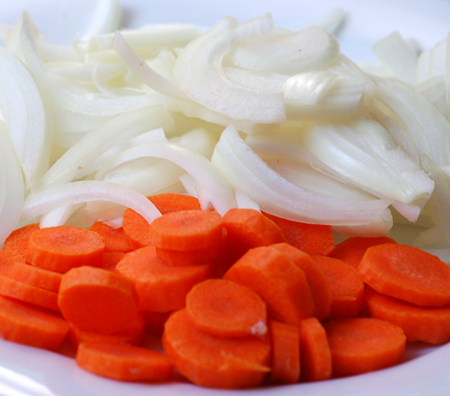 Don't make the mistake of cutting it smaller: this will adversely affect your stew. After cutting your meat, dry it well with lots of paper towels. This will significantly improve the browning. This rule applies to all meats and fish. I chose a Côtes de Rhône wine, but we all know that a good burgundy would be perfect. The former is much more readily available and more affordable, and I think it was pretty wonderful both in and accompanying the dish. Julia used dried herbs and I prefer fresh, as they are just a few steps away in the garden. 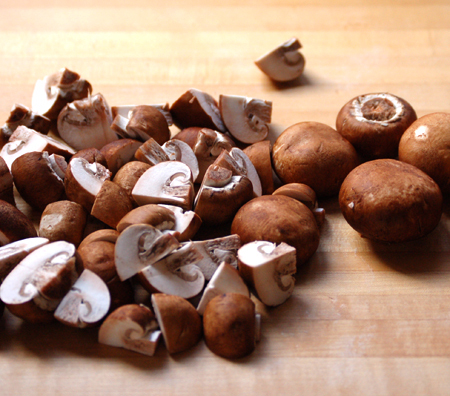 Cremini mushrooms were my choice, as they are meatier and actually add more flavor. Button mushrooms are the more authentic choice, though. 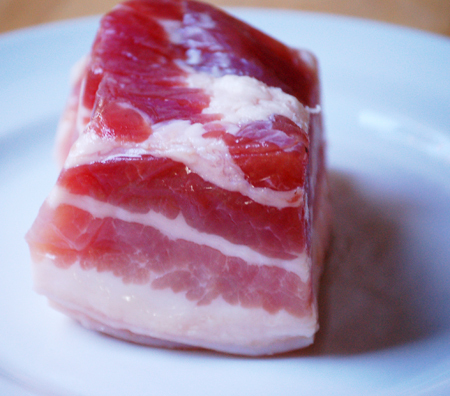 Remove rind from the slab of salt pork. Slice the salt pork into 1/4-inch slices and then into 1/4-inch batons. Place into a small saucepan of boiling water and reduce heat. Simmer for 10 minutes and then drain; dry well with paper towels. Set aside; both the rind and the batons will be used. Heat 1 tablespoon olive oil in a Dutch oven over medium heat. Sauté the batons of salt pork for 2 to 3 minutes until lightly browned. 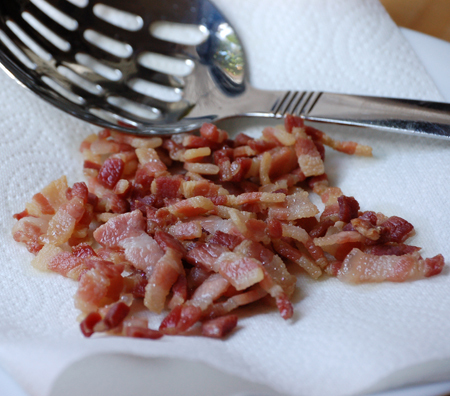 Remove the salt pork from the pan with a slotted spoon and put on a plate; set aside. Raise the heat under the Dutch oven to medium high and add your dried beef cubes to the oil, a few at a time, as not to crowd them. There must be space between them otherwise they won't brow properly. Brown the cubes on all sides, then remove the and add them to the plate with the sal pork. Repeat the browning until all the beef is used. 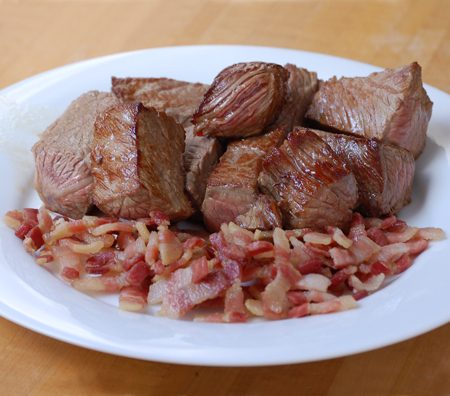 Return the beef and salt pork to the Dutch oven and season with the salt and pepper. The sprinkle with the flour and toss to coat. Place the Dutch oven in the preheated oven for 4 minutes, remove and toss the beef, then bake for an additional 4 minutes. This process toasts the flour. Reduce oven heat to 325°F (170°C). Add the wine and 2 cups beef stock to the meat, so that the meat is barely covered. If necessary, add more stock to cover the beef. Add the tomato paste, herbs and reserved bacon rind. Bring it to a simmer on top of the stove, then cover it and place it in the oven. Check after 15 minutes to make sure the stew is at a simmer. If it is more than a simmer, reduce heat. Conversely, if it isn't simmering, raise heat 5°. The meat should be done in about 3 hours - and will be very tender when pierced with a fork. Some cuts of meat (bottom round, for example) might take longer - up to 4 hours. 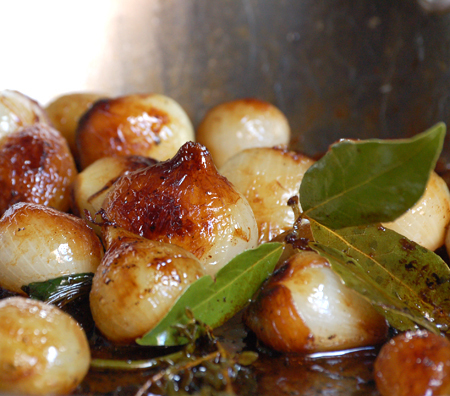 While the beef is in the oven, prepare the onions and mushrooms. 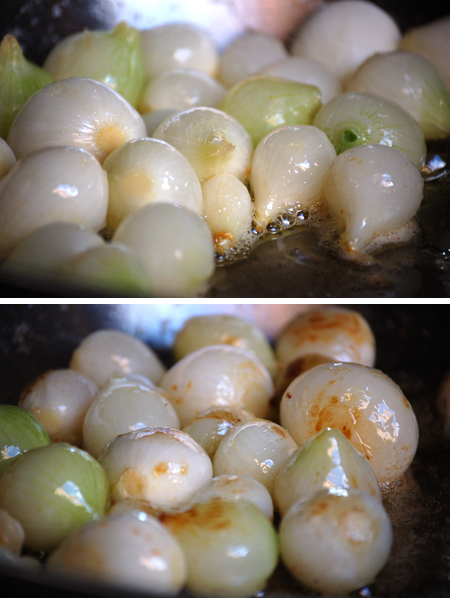 To brown-braise the onions, heat the butter and oil in a skillet until bubbling. Add the peeled onions and sauté over medium heat for about 10 minutes, rolling the onions so that they brown evening on all sides. Take care not to break their outer skins, and (per Julia) don't expect them to brown evenly. Pour in the 1/2 cup beef stock and add the bouquet garni. 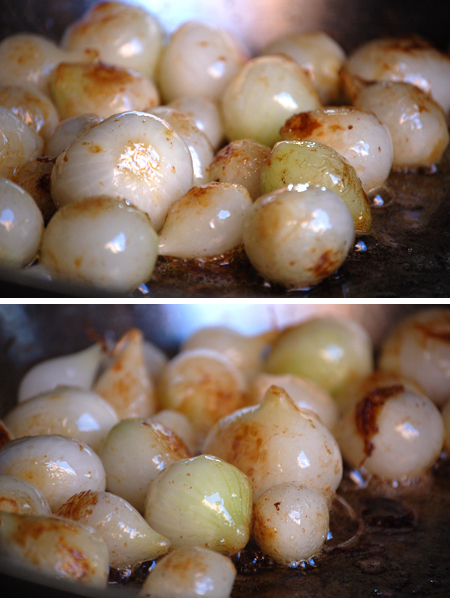 Cover and simmer slowly for 40 to 50 minutes, until onions are tender and still retain their shape. At this point, most of the liquid will have evaporated. 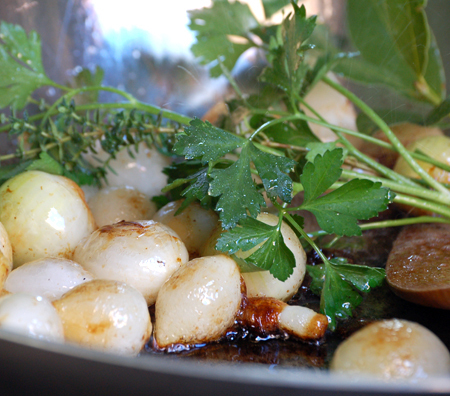 Remove the bouquet garni, and reserve onions for the stew. 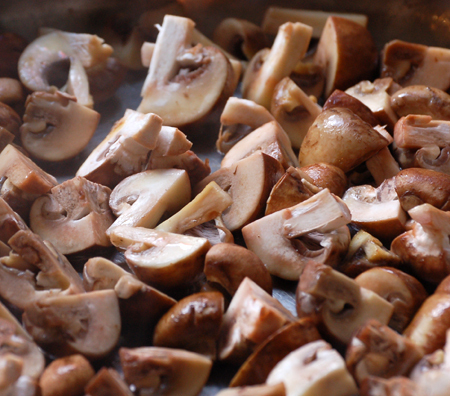 Sauté the mushrooms. Julia's advice in this is spot on, and something I learned and will never forget. Sautéing mushrooms is easy following her counsel. Place a large (14-inch), heavy skillet over high heat with the butter and oil. As soon as the foaming of the butter begins to subside, add the mushrooms. Toss and shake the pan for 4 to 5 minutes. In this time, they will fist absorb the fat. In a couple of minutes, the fat will reappear and the mushrooms will begin to brown. As soon as they have browned lightly, remove them from the heat and set aside. When the beef is fork tender, pour the stew through a sieve set over a saucepan. Wash out the Dutch oven and return the beef and salt pork (this is where she doesn't mention the carrot and onion) to it. Add the brown-braised onions and sautéed mushrooms to the pot. Skim the fat off the strained sauce, and simmer for a couple of minutes skimming any fat that rises. This will depend on how lean your beef was to start. You should have 2 1/2 to 3 cups rich, thick sauce that coats a spoon. If too thin, boil for a couple of minutes to reduce it. If too thin, add some beef stock a couple of tablespoons at a time. Pour the sauce over the meat, onions and mushrooms. Cover Dutch oven and simmer for 2 to 3 minutes, stirring gently a few times. Serve over egg noodles, rice or boiled potatoes - or, as we did, with a nice crusty bread and a nice tumbler of wine. Julia says it will serve 6, but I find it easily serves 8. I can't wait to try this! 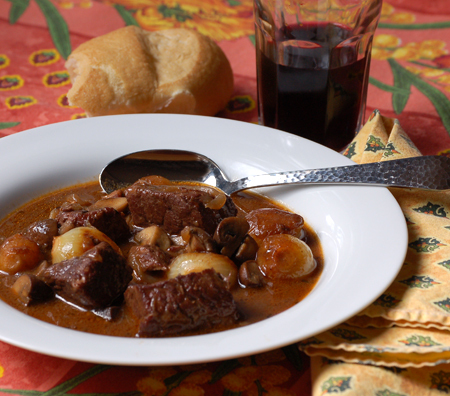 I have made Beef Bourguignon many times - successfully. However, your version looks so rich and delicious. I can't wait to try this. Thank you so much for sharing. The potato to absorb the salt is one tip my grandmother taught me, and it works! 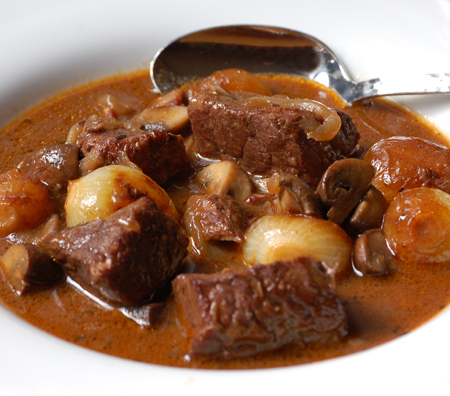 My mother used it pretty often...Bourguignon is such an extraordinary dish, worth every minute spent making it. This looks succulent David! 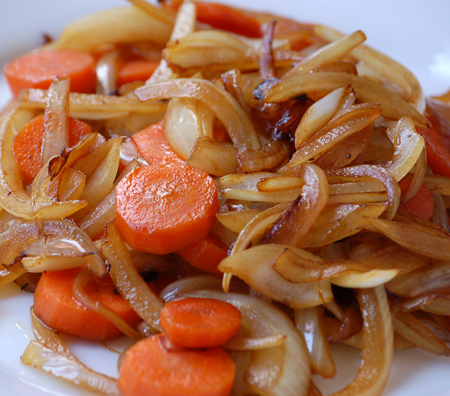 One of my favorite parts are the onions which are good for any stew really. I learned to make one with a whole bottle of red wine in it but haven´t made it in years. The only thing I should try to find is the salt pork, which I never knew how to ask for it here. Have a great week! Thanks, JC - let me know what you think when you try Julia's version. Paula - isn't the potato in the soup a brilliant thing? And I agree - the onions are good just by themselves as a side dish. And how to cook the mushrooms was a revelation to me! Nope, Karin, that doesn't surprise me a bit! So cool that you got to meet Alex P. His work with Julia to bring that book about was amazing. I read that book and as much of the other as I could stomach. What more could ya want, right? Not much more than that, Colette! Thanks, Anna. While not an Aussie, I do like Shiraz a lot, too! It would be perfect with Julia's BB! I think this would be awesome with Persian rice, Ahu! What a great idea! Do you have a recommendation for a mushroom substitute in this? We are a family that really doesn't like mushrooms, but when I make beef bourguignon and omit them, it always feels like it's lacking something earthy. I tried celeriac, but we're not too fond of that either, so I've taken to adding cubed potato (Julia will be turning in her grave...) for the moment. But any other suggestions would be very welcome! Hmmmm. no mushrooms... that is a conundrum. Considering the other flavors, I would rule out lots of things, but then consider these others. I would leave in the cooked carrots, and perhaps add some parsnips, or roasted peppers, or even some lightly roasted chunks of zucchini. It is the earthiness that would be missing... You know, some winter squash in there might be excellent, too. Let me know if you try anything and how it works. Thanks -- I'll let you know! I am so glad that I saved this post until I had the time to thoroughly enjoy your thoughts about Julia and to fully digest her teachings (through your eyes). When I read your first paragraph, I knew this post would be special. What warm memories you share of you and your mother watching Julia. How fun to think of your mother and Julia as you make certain meals. I agree completely with you about the movie--can we cut Julie out puleese?! You have inspired yet another meal for our family and friends. I don't think I have ever made Julia's version and now, with your notes, we will endeavor to do so. Another good winter meal! Finally, just pondering your above reader's inquiry about leaving out the mushrooms...maybe cannellini beans? Would that be crazy? Thanks, David, for a piece that warmed my heart. Susan - thank you for your wonderful comment. This post really took me back - and yet I remember it as if it were yesterday. Yes, let's find someone to cut out Julie... we could share the cost! If only we could afford to hire Meryl and Stanley to make a few more scenes! Hmmmm. cannellini beans. Interesting thought. I will write to her and let her know your idea.